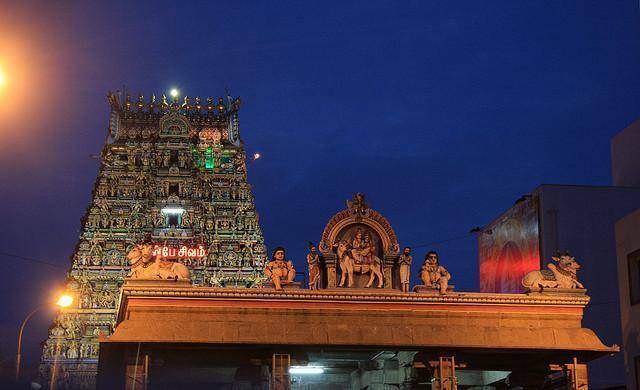 The oldest and most sacred religious spot in Chennai is none other than the Kapaleeshwar Temple. It is a 7thc century, popular Dravidian temple situated in Mylapore area of Chennai. Tourists are awestricken by the tallest gopuram (tower) of this ancient temple which dominants the surroundings. The temple is dedicated to Lord Shiva and Goddess Parvati. As per hindu mythology, it was in this place Goddess Parvati worshipped Lord Shiva in the form of Peacock (means Mylai in Tamil Language) and thus the area got its name Mylapore. There are two Gopurams for this temple. When we enter from East Gopuram, there we can see a huge idol of Lord Narthana Vinayagar. Lord Shiva and Goddess Parvati have separate shrines. We can see the Lord Shiva is worshipped in the form of Shiv lingam here. There are many Mandapam were devotees can sit and relax after worshipping Lord Kapaleeswarar. Chennai people believe that the Goddess Karpagambal grants each and every wish of her true devotees. There is a sacred tank in the front of the temple where devotees take dip.